WASHINGTON – Pope Benedict XVI has accepted the resignation of Bishop John H. Ricard of Pensacola-Tallahassee, Fla., and appointed Miami Archbishop Thomas G. Wenski to be the diocese’s apostolic administrator until the installation of a new bishop. The resignation and appointment were announced March 11 in Washington by Archbishop Pietro Sambi, apostolic nuncio to the United States. 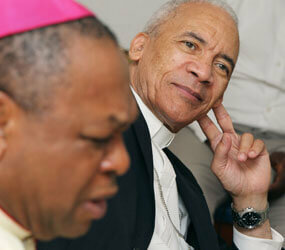 Bishop Ricard, 71, retired for health reasons. In 2009, he suffered a stroke and was hospitalized. He has undergone subsequent surgeries. He is four years younger than the age at which bishops are required by canon law to turn in their resignations to the pope. Bishop Ricard, a native of Baton Rouge, La., was named bishop of the Pensacola-Tallahassee Diocese in 1997 and previously served as an auxiliary bishop in the Archdiocese of Baltimore. On the national level, he has been chairman of the U.S. bishops’ Subcommittee on the Church in Africa and has served on the bishops’ international justice and peace committee and the national collections committee. In retirement he will be in residence in Pensacola.